You get what you pay for! The cleaning company that I had previously used was not available for my short noticed so I tried TidyWhity as they were able to accomodate my short notice! However, I arrived at home and a gentleman approached me stating he was with the cleaning company. I asked if he was going to do the cleaning and he responded that the two ladies with him where the cleaners. Unfortunately, I still had workers in my home finishing a reno so the 3 bedroom cleaning job would now only be the kitchen a small powder room and the living/dining room. This was my fault and I indicated that I would still be paying for the full amount quoted even though the service was for a quarter of the space. They enter my home and the gentleman who stated that the ladies where the cleaners immediately started cleaning the powder room. He was scurrying around cleaning as if I was an inconvenience to him and they only had 5 minutes! Then one of the ladies exclaimed that she would not clean the fridge as there was food in it. Who has a fridge with no food??? The other lady jumped in and said she would take care of it. I also asked for eco friendly cleaning, but the rags and sponges they were using have had better days. They were probably cleaning for about an hour and I couldn't wait for them to leave so that I could reclean everything. We moved into our home in 2009 and are in year two of a five year reno. We requested quotes from 10 stair/hardwood companies and of the 10 only 3 responded. Of the 3 we chose Goldwood as they were very accomodating with my timeline and their customer service during the onsite quotation was unsurpassed. During the installation process the workers were extremely diligent and it showed in the outcome! Their attention to detail was great, I had given them a basic idea of what I wanted and they ran with it...it turned out more amazing than I had hoped for. We still have more renos to do in our home and we will definitely be calling Goldwood again! It was a pleasure working with you Christine! We will be looking forward to your future renovations. For now, hope you have a happy New Years! We were in the midst of getting our new front door installed when we realized that we needed a new lock set for our door. Our door needed a narrow multipoint handset and is not very common. Dr. Locksmith came as a recomendation and when we called we received a professional, fast and courteous response. Moni managed to obtain the perfect lock set for us in a day! His friendly demeanor and knowledge of his trade was greatly appreciated. Emailed a few companies for a quote on bricking up a window and Dave was the first to respond. They were able to squeeze in my project earlier than scheduled as the weather was very accomodating. They showed up on time and they were very polite and professional. The brick they chose blended well with the existing brick and they left the site cleaner than they found it! I will definitely use Red Robin again for our future Masonry projects! We had been renovating our house for over a year...room by room and the construction grime was just getting worse and worse. I originally tried to get Maret's Cleaning Services in July, but they couldn't make it in the short notice I gave. I hired an independent cleaning company to come in, but I wasn't happy with the outcome. Two month's later, we were having out of town guests staying with us and I called Maret. This time she was able to squeeze me in! Her team showed up and I left for the day, when I returned I could not believe how clean our house looked and smelled. They cleaned items that I would not have even thought about! When my husband returned from work that day he said it now feels like home! Thank you so much Maret! Thank you for your kind review. It was a pleasure to meet such nice people like the two of you. We are happy to have been able to help you this time and we look forward to see you again! My husband left for an unexpected trip and I wanted to surprise him with a renovated bedroom for a nursery. I called/emailed numerous demolition companies and Frank returned my email immediately. Extremely courteous and was willing to accomodate my timeline without hesitation. They came on time (not common for contractors) and removed the old wall panelling, then the plaster and lath and insulation from all four walls and the ceiling! Removed all the debris from the house and even vaccumed the room upon completion! They were great! We live in an old house and are renovating room by room, so I will definitely be calling Frank again! Just moved into our first home and had very little in budget for renos...any boy did this house need renos. 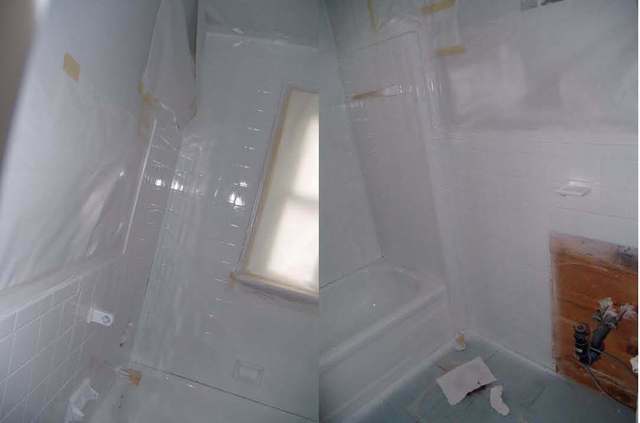 We opted to reglaze the bathtub and forgo the renovation in that room for a couple of years. There was no way I would even step in there without my flipflops on! 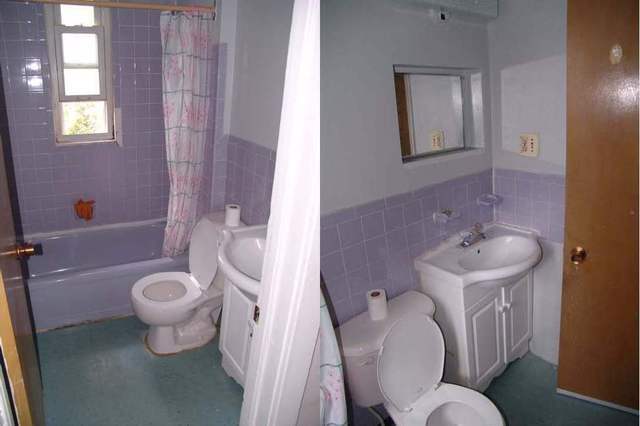 Any to my surprise it is a completely new beautiful bathroom! The gentlemen who preformed the work were extremetly polite and meticulous and Angela was quite helpful with all my questions prior to the work being done! I definitely recommend the TUB GUYS! Sorry...my photos don't do it justice!